"Tsunami." "Deluge." "Gusher." "Barrage." "Political oil spill"…. The fossil fuel industry’s spending spree against climate initiatives this year almost broke the bank of journalistic disaster metaphors. So. Much. Money. And it worked here in Washington, steadily eroding the strong initial support for Initiative 1631. Canvassing for the measure, you could hear the poll-tested, media-saturated messages in voters’ skeptical questions. $31 million worth of smoke bought plenty of confusion and, as it turned out, a majority of No votes. Yet despite the results, the Yes on 1631 election night bash felt a lot like a victory party – an immense, high-energy gathering of a movement on the rise. Of course there was disappointment, but not an ounce of resignation. And in the breadth and determination of the coalition behind 1631, you could feel the emerging momentum even as we absorbed the setback. It was almost as though people had to remind themselves to be subdued, under the circumstances. On the other hand, imagine what the No on 1631 “victory” party must have been like. Who came? What did they say? Did they bring their kids? In their moment of triumph, how exactly did they describe their accomplishment? What did they feel they had won? Unlike the Yes party, I’m sure they had an open bar, but what did they toast? I won’t try to hide my anger at what Big Oil did in this campaign. But this tale of two parties is neither a sour grapes exercise nor a healing ritual. It’s an effort to understand what’s being won as well as what’s lost. Yes, the vote was a sharply-pointed reminder that Oil still has the hole card in the political game – money. Given a political system in which spending runs amok and truth is optional – the system we’ve got – Oil can still have its way too often. We can and will absorb the strategic lessons of this loss and adjust accordingly. But this money thing remains a big systemic problem. And yet, after watching Oil impose its will on Washington these last few months, I come away unimpressed with their underlying power. Oil’s money was dispositive last week, but it’s a dreary affair, this propping up of late-stage empire. And in the cold, cynical efficiency of it, you can sense the fundamental weaknesses that will ultimately bring Oil down. Oil’s most obvious liability is their growing isolation. Ninety nine percent of the No campaign budget was from the petroleum industry. The business community no longer reflexively rallies around Big Oil as one of theirs. Clean energy is a much bigger driver of jobs and prosperity in Washington than fossil fuels, so the economic constituency for oil dependence here is dwindling. Labor unions, communities of color, conservation groups, tribal nations, businesses large and small, health professionals, faith communities – over 400 organizations – found common cause in a campaign that united economic opportunity, climate action, and social justice. And with the steadfast leadership of first nations and frontline communities – those who suffer first and worst from pollution and climate impacts – the campaign developed the deep resolve of a movement for justice. More than 6,000 volunteers worked on the Yes side; I’d be surprised if the No campaign had even one. Oil’s money bought them a No vote, but no love. Big Oil did manage to deceive a lot of voters with relentless appeals to economic fear and distrust of government. 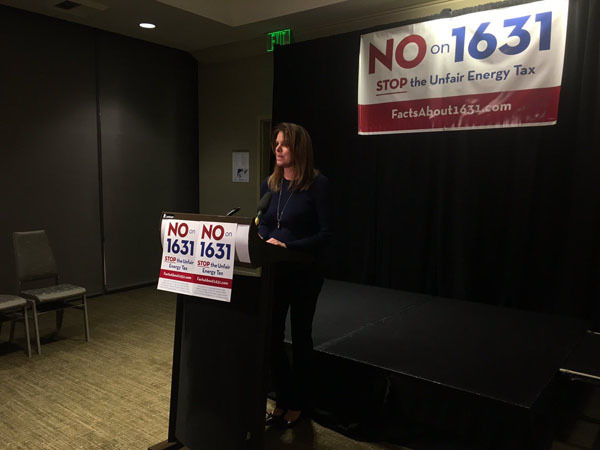 In effect, No on 1631 was a Yes on Oil campaign, but since hardly anyone’s actually for that, they couldn’t campaign on their merits. Their strategy of blocking all the exits from fossil fuel dependence can only prevail as long as our willingness to be captive customers persists. With every sale of an electric vehicle, every solar or wind power installation, every transit improvement, every new unit of affordable housing in cities, every decline in the cost of clean energy and efficient buildings... a better prospect becomes more irresistible. Finite, dirty, oligopolized fossils can’t compete with free, clean, ubiquitous sunshine forever. On the strength of this accelerating transition, climate and clean energy did reasonably well in the midterms, including a decisive victory for the Portland Clean Energy Initiative. Only where they resorted to “brute financial force” could Oil prevail. This is all nonsense, of course, and not just because Oil companies are demonstrably acting in bad faith. They can’t support a truly effective climate policy, because such a policy would by definition leave most of their carbon reserves – their biggest assets – unburned and worthless. They are trapped in their own spectacularly profitable carbon-extracting, wealth-concentrating, climate-wrecking machine. But the fact that they feel compelled to look like they’re interested in solutions suggests that they see the writing on the wall too. Oil will certainly do everything in its power to forestall the day of reckoning. But at some point, being the conspicuous roadblock (I’m looking at you BP) might begin to weaken one’s hand when the carbon bubble finally pops and the bill for climate damages comes due. The ultimate weakness in Oil’s position, of course, is the increasingly naked depravity of its business model: Oil’s commercial interests are now aligned squarely against the prospects for stable human civilization. Over the course of just the few months of the No on 1631 campaign, huge swaths of the West burned; climate-juiced superstorms hammered Florida, North Carolina, and the Marianas (and that’s just in the U.S.); scientists discovered rapid acceleration in Antarctic ice loss; and the oceans were found to have absorbed 60% more heat than previously thought. Oil’s spending against 1631 ramped up steeply after the IPCC’s stunning new report calling for emergency climate action. The industry has backed itself into a corner where it must inadvertently aid our efforts to revoke its social license, as it answers growing climate urgency with ever-larger expenditures on political deception and intimidation. It’s now clear that the world will have a viable oil industry or a decent future, but not both. Oil may have had the “victory” party last Tuesday but what it “won” cannot endure. And at the Yes on 1631 party, the energy and power of a gathering movement was palpable despite the outcome. The “winners” are an old and dying order, squandering their legitimacy, playing out the last of their entrenched and increasingly abusive power. And the “losers” are young, rising, and emboldened – not intimidated – by Oil’s desperate tactics. Political outcomes will inevitably follow these trends. I don’t believe Oil can ultimately “prevail,” in the sense that we choose or capitulate to its survival over humanity’s. The danger is that they’ll keep throwing enough sand in the gears to prevent us from acting as boldly and rapidly as we must to save ourselves. Bill McKibben has said that in the fight for a livable future, “winning slowly is the same as losing.” And because Big Oil’s interests are now diametrically opposed to humanity’s, the obverse is also true: for them, losing slowly is the same as winning. Even after everyone’s gone home, they’ll keep drinking alone ‘til we close the bar. Time is not our friend. And patience with Oil’s waning but still lethal tyranny is no virtue. P.S. I know everyone’s hungry for what’s next, what was learned, what we should change going forward. Lots of hard-nosed reflection and strategy improvements to follow. But for the moment, full credit where credit is due – to the 1631 campaign for its courage, its tremendous organizing, its brilliant coalition-building, and its relentlessness.